Ambrosia integrifolia Muhl. ex Willd. ^ a b "Ambrosia trifida". Germplasm Resources Information Network (GRIN). Agricultural Research Service (ARS), United States Department of Agriculture (USDA). Retrieved 22 December 2017. ^ Stallings, Ben (2014-06-20). "Ragweed: Curse or Blessing, the Choice is Yours". Permaculture News. Permaculture Research Institute. Retrieved 27 June 2014. 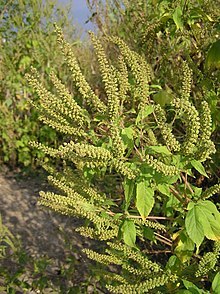 Reaume, T. Great Ragweed – Ambrosia trifida. Nature Manitoba. 2011. Wikimedia Commons has media related to Ambrosia trifida.